Iron Mountain Incorporated (NYSE:IRM) , the storage and information management company, today announced an expanded set of services, called the Iron Mountain Inventory Governance solution, designed to help organizations ensure complete governance over their physical records inventory stored securely offsite. This helps fulfill a key regulatory requirement for demonstrating proof of control over personally identifiable information, which is among the most highly regulated and vulnerable types of information retained by organizations. Additionally, Iron Mountain will introduce industry-first and only radio frequency identification (RFID)-ready boxes, available in early 2015. According to the 2014 PwC and Iron Mountain Information Risk Maturity Index, handling paper records is considered the greatest hazard to information security, with 67 percent of European and 49 percent of North American businesses ranking this as the biggest risk, more than twice as high as external or malicious attacks. Furthermore, the report found that only 36 percent of European and 28 percent of North American businesses effectively monitor their information management processes for the safe security, storage and disposal of confidential information. The Iron Mountain Inventory Governance solution addresses these issues head-on by building in inventory validation, retention and audit capabilities right into the normal physical records management chain of custody process. The solution, available as Iron Mountain Inventory Governance, combines three services that have already been employed in select customer situations and are now broadly available: Data Validation to ensure metadata – key information about the content companies store – is attached to newly created boxes sent to offsite storage; Data Integrity to ensure metadata is attached to legacy information already in storage; and Inventory Audit options for tracking and auditing inventory stored securely offsite using physical scanning or radio frequency identification (RFID) technology. In early 2015, Iron Mountain’s new RFID-ready boxes will come with RFID tags pre-applied, making the path to complete inventory governance easier at no additional charge. Through this solution customers can prevent and remediate inventory discrepancies, increase information accessibility, reduce overall information management costs and satisfy internal and external audit requirements. CSC, a global leader of next-generation information technology (IT) services and solutions, has leveraged Iron Mountain’s Inventory Governance offering to streamline their records management program. CSC remediated their legacy records inventory – effectively attaching metadata to records previously missing it while also identifying information eligible for defensible disposition. By improving their metadata health, CSC improved access to records while also reducing the costs associated with storing information no longer required to be retained. For more information on Iron Mountain’s Inventory Governance solution, visit www.ironmountain.com/Services/Records-Management-And-Storage/RIM-360/Inventory-Governance-Solution.aspx. 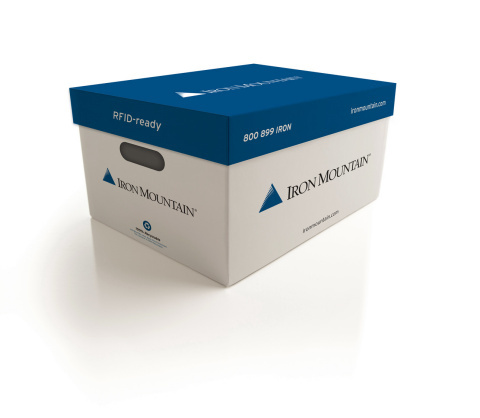 And to see RFID-ready boxes in person, stop by the Iron Mountain booth (#1119) at ARMA 2014 or visit www.arma.ironmountain.com.